The much awaited Maruti Suzuki Ignis was launched in India with a starting price of INR 4,56,000 (base petrol model), the diesel version of Ignis starts from INR 6,28,000 (ex-showroom Delhi). The car is to be sold exclusively through the Maruti Suzuki's NEXA dealerships in India. 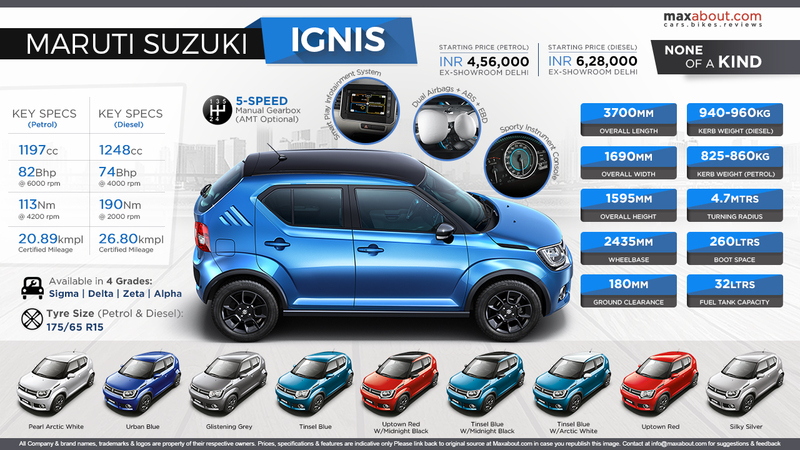 Ignis is available in four grades (Sigma, Delta, Zeta and Alpha) for the petrol engine while the diesel in limited to three only, leaving the Sigma variant to the petrol engine only. Apart from that, the 5-Speed AMT gearbox is optional for both engines.